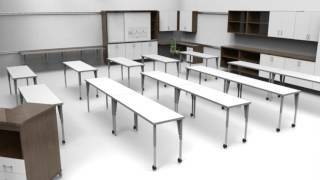 Whether you are adding an entire computer lab or simply adding a workstation to your space, elements™ counters are a comprehensive and flexible solution. Since the surfaces are track-mounted, if your needs change, you can easily remove or reconfigure them. Depths - 20", 24", 30"
Widths - 30", 36", 42", 48", 60", 72", 84", 96", 120", 144"
Square - 30 x 30", 36 x 36"
Returns - 24/24", 30/24", 24/30", 30/30"
Allows worksurface support arm to attach at adjustable heights 23" to 29"H at one inch intervals. elements™ is a very flexible product line. Through the addition of available storage and support components, the possibilities are only as limited as your imagination.